If you don't want to add filters to a new view from scratch, you can leverage an existing view by copying its filter set to a new view. After you create the new view, you can edit the copied filters as needed. NOTE: You can also leverage an existing view by saving its filter set as a new view. To copy filters to a new view, you start by creating the new view. 3. In the Copy filters from dropdown, select the view whose filters you want to copy. 4. Select a Visualization Type for the view. You can skip this step and add the visualization later. 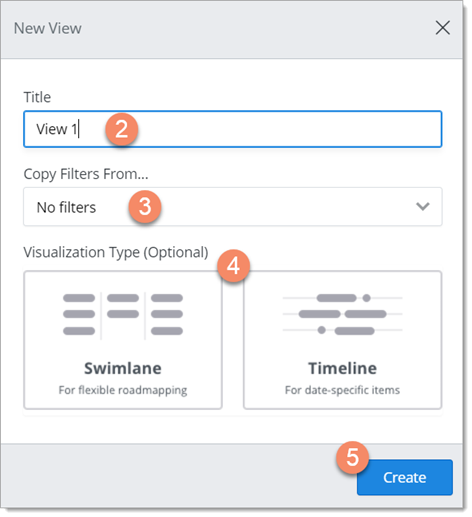 To continue creating the new view, go to Create a new view in this collection and Filter items in Creating and Working with Items and Milestones. Who can copy filters to a new view? The permissions to copy a view's filters to a new view and to create a new view from scratch are the same. You must be the roadmap Owner or the roadmap has been shared with you as an Editor. If you share the roadmap as a Viewer, you can't add any new views to it no matter how.